Fishin' the Woodpile for Walleyes - "An often overlooked tactic"
Fishing in the woodpile? I realize winters can get rather long and that about now some of you might tend to think that over the winter I have been sniffing to much wood smoke. However, let me elaborate. By "woodpile" I don't mean that stack of cord wood in your back yard that managed to evade the woodstove over the winter. What I am really referring to is the drowned wood or trees you often find commonplace in almost any lake, river, or stream. During the spring and early summer period, fishing this drowned wood can often be the key to consistently catching fish. Yet, not all wood will attract and hold fish. Learning which wood, when and how to fish it will often help you to catch not only more but also bigger fish. Differences in wood; Wood in one form or another is one of the key fish holding forms of cover on almost any lake, river, or stream. While it is true that most small stream anglers commonly fish around drowned wood or down trees, often this wood is overlooked by anglers on lakes and even rivers. Probably the most overlooked is the wood that is in shallow water. Not all shallow wood will consistently attract and hold fish though. Look for the most productive down trees, stumps, and logs to be found in shallow water where there is quick access to deeper water. If that deeper water also has cover present in the form of either wood or weeds the adjoining shallows may be even more productive. On rivers or flowages these areas are usually located just off the deeper river channels. In the spring these shallow areas warm much faster and provide more forage, this in turn draws more fish of all sizes. Besides the cover and forage that it provides fish on lakes and flowages, on rivers and streams wood often provides a current break as well. Easy fishing vs. tough fishing; Exactly how you go about catching fish from wood cover depends on several things. The most important factors are usually the activity level of the fish, the depth of the wood cover, and the water temperature. During low light periods or on stormy overcast days fish tend to be more active and aggressive. These are the easy times, the times when the fish are really biting. When you are fishing for active fish simply retrieving lures over or around the wood will usually produce strikes. For active fish, lures that produce plenty of vibration and flash like a "Beetle Spin" or a rattle type crankbait are usually your best choice. For a little less aggressive presentation swimming a simple twist tail grub rigged on a plain lead jig over the wood works wonders. In darker water or in low light you want to add a little more flash to this presentation by using one of the new "Sizzler Grubs" rigged on a jig. The new shiny reflective silver coating these grubs have on the curl tail really increases the flash given off. Okay now that we have discussed catching the easy fish, how about the times when they just don't seem to be biting? Things like cold fronts, increased light penetration, cooler water temperatures, and even increased fishing pressure can really turn the fish off and make fishing tough. As fish activity moves away from active toward inactive they most often tend to hold tighter to cover. Usually they will still strike a lure or bait but they just won't chase it. What this means is that you must put your bait right in their face to get them to take it. Sounds easy but here's the catch. Wood and fish hooks don't usually get along to well with each other. When the fish are holding down in heavy wood cover sometimes just getting your bait in front of them without snagging up can seem impossible. Yet there are a few tricks that will help you effectively fish in heavy wood with very little snagging up. The art of snag free fishing; Fishing in any heavy cover without snagging up all the time can easily be done if you approach it as a whole different way of fishing. Simply tying on a weedless jig or hook will not keep you from snagging in wood if you are doing every thing else wrong. Besides using jigs or hooks that are more snag resistant there are a couple of other important details you should not overlook. Weight and line angle. Jig or sinker weight should be kept to a minimum, use only as much weight as necessary. Excess weight causes the bait to drop quickly into cracks and crevasses in the wood where it can become wedged. Line angle can also contribute to snagging due to wedging. When fishing wood you should always try to keep your casts very short and work close to the boat. This keeps your line angle closer to vertical and your bait more snag free. Snag free rigging; When fishing less active fish in shallow wood cover one of the most productive presentations is simply flipping a small weedless jig or a weedless hook tipped with live bait into the wood and slowly swimming it back out. You should concentrate on keeping it in contact with the bottom and the wood. Another presentation that works well is to fish these same weedless jigs or hooks below a slip bobber through the holes and pockets in the wood. Generally you are best to keep the weight to 1/16 ounce or less in the shallow stuff and no more than 1/8 ounce in the deeper wood. For rods and reels, the longer sensitive graphite models in 6 to 7 foot lengths, like the St.Croix LS60ML or the LS70ML teamed up with quality medium light spinning reels like the Mitchell 630LS, are the best choice. Their extra sensitivity will allow you to feel light strikes, the wood, and lighter jigs also the longer length helps you to keep the line angle more vertical which helps to avoid snags. Because the line is often in contact with the wood and is subject to damage you should use an abrasion resistant line like Trilene XT. On the business end of your line quality snag resistant products like the Brush Hog weedless jigs from J.M.Tackle Co. Rt.4 Box 4162 Hayward Wi.54843 or weedless hooks like the Bucher Brush Hook from Joe Bucher Tackle Company are absolutely necessary. They come in several colors and sizes and are designed to allow you to effectively fish in heavy weeds as well as wood. I know that when spring is finally here we want to forget about winter, cold weather, and the wood pile and get in some quality fishing time. Only don't forget about the wood just yet. This is one woodpile we can really enjoy for a change. 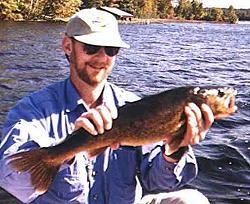 John H. Myhre is a professional outdoor communicator and Wisconsin licensed guide from the Hayward, Wisconsin area. John own's Sportsmen's Lodge on Moose Lake. He can be reached at 715-462-9402 or you can e-mail him at info@wiscnorthlandoutdoors.com.